When it comes to getting your carpet professionally steamed cleaned in castle Rock Co there are many reasons for cleaning your carpets. There are spills, spots, stains and traffic patterns. There are pet problems such as urine in the carpets from dogs and cats. The list for having your carpets professionally steamed cleaned goes on and on, but what if your carpets don't look dirty? you might say no need to right? Well think again. If your family members deal with allergies there maybe something lurking in your carpets that need to be dealt with. Im talking about the common dust mite. Isn't Fred a handsome fella. You might be saying well if I seen him I would know. Uh, no that would me wrong Fred is microscopic. Here are some thing you should know about Fred and why you should have your carpet steamed cleaned. Dust mites are microscopic creatures that live in pillows, mattresses, blankets, carpets and other soft materials. They look just like insects, but are microscopic arachnids, relatives of spiders and ticks. They do not live on people, but in your carpets. Their food is the dead skin scales that we all shed every day. 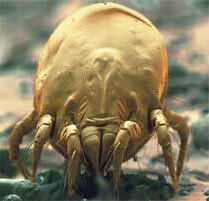 Dust mites avoid the light, and require at least 50% relative humidity to survive. They are therefore plentiful in soft materials, such as pillows, mattresses and blankets, where they can burrow into the fabric to get away from the light. Beds provide the warmth, darkness, high humidity and shed skin scales that mites crave, and they are the source of the biggest mite exposure for most of us. So mattress as well as carpet cleaning maybe something to consider. A mattress may contain over a million dust mites. A female mite lays about 60 eggs in her lifetime. This is why carpet cleaning is a must. Each mite lives for about 80 days, during which time it produces one thousand allergy-causing waste particles and all of this is taking place inside your carpets. Live mites themselves are not inhaled. Rather, it is the waste particles that they have produced, and the body fragments of dead dust mites, that become airborne, are inhaled and cause allergy symptoms. This is because mites do not live in the air, but are burrowed in soft materials. Mite waste particles become briefly airborne when one walks on a carpet, sits on an upholstered chair, places one's face on a pillow, makes a bed, or otherwise disturbs the soft materials where the dust mites are living. Having your carpets professionally cleaned by TLC Carpet Care will completely kill this infestation.